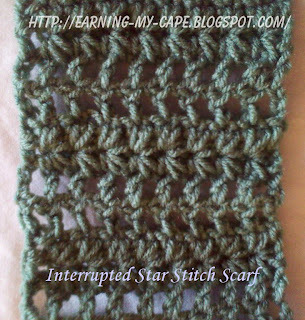 This scarf used the fun-to-crochet star stitch. 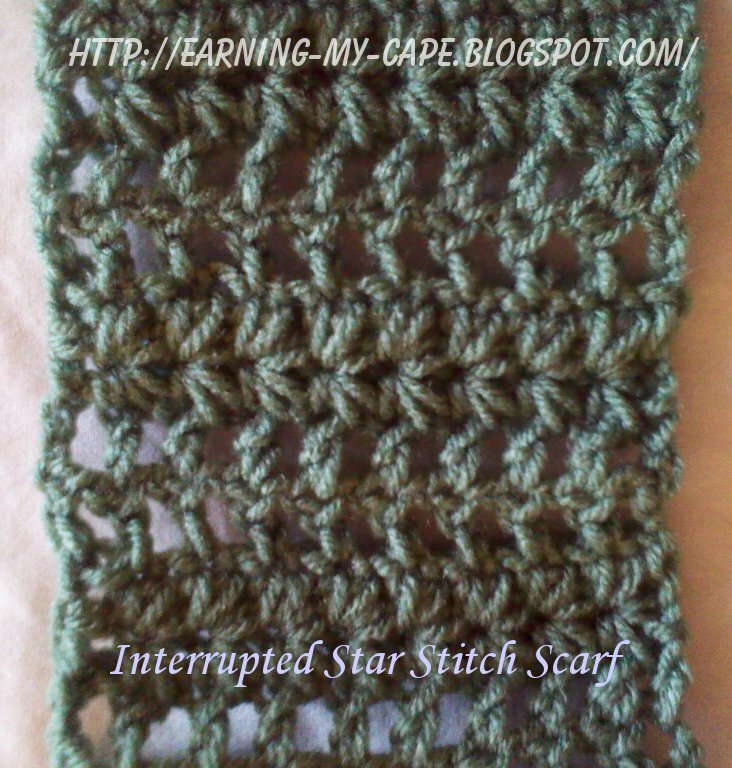 The star stitches are interrupted with a couple of rows of "open" double crochet stitches. I think that breaking the rows up in this way allows the star stitch to stand out a bit more. The stitches are not difficult, and after you work a few rows, it goes much quicker. You can continue the scarf to your desired length. You can add a fringe, if you like. This scarf can easily be modified into an infinity scarf by sewing the ends together. 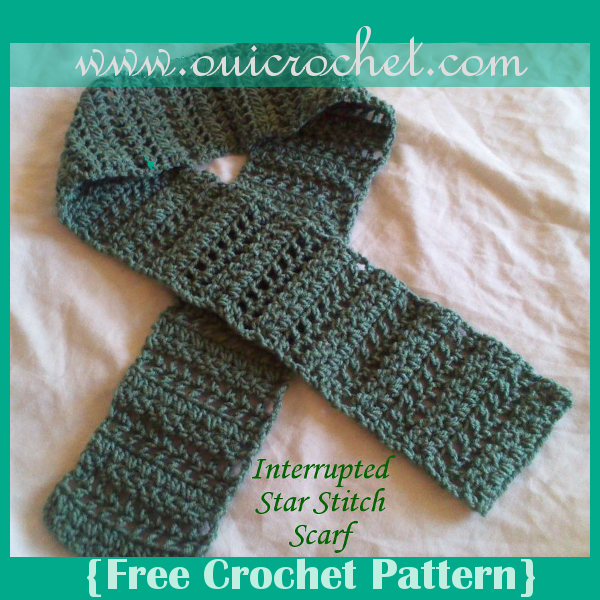 The interrupted star stitch scarf makes a nice addition to any scarf collection. It makes a wonderful gift, as well. Row 1: Insert hook into the second chain from the hook and pull a loop of yarn through. Pull up loops in the next 3 chains. This will give you 5 loops on the hook. Yarn over and pull through all 5 loops on the hook. Ch 1 to create the "eye" of the star. Now, insert your hook into the eye of the star you just made and pull up a loop. Then insert the hook into the same stitch where you last pulled up a loop for the previous star and pull up another loop. You should now have three loops on the hook. Insert your hook and pull up loops in the next 2 stitches. Now you have 5 loops on the hook as before. Yarn over and pull through all loops, then ch 1 to create the eye. Row 3: Ch 4. Dc in second hdc. (Ch 1, skip 1 hdc, dc in next hdc) across the row. Ch 1, then dc in the top of the ch-3 from the previous row. Turn. Row 4: Ch 4. (Dc in next dc, ch 1) across the row. Dc in the third ch of the ch-4 from the previous row. Row 5: Ch 3. Pull up a loop through the second and third stitches on the starting ch-3, then skip the stitch at the base of the ch-3 and pull up loops in in the next ch-1 space and in the next dc. Ch 1 to create the "eye" of the star. Now, insert your hook into the eye of the star you just made and pull up a loop. Then insert the hook into the same stitch where you last pulled up a loop for the previous star and pull up another loop. You should now have three loops on the hook. Insert your hook and pull up loops in the next ch-1 space and in the next dc. Now you have 5 loops on the hook as before. Yarn over and pull through all loops, then ch 1 to create the eye. Repeat this pattern across to the last stitch. Work 1 hdc in the third ch of the ch-4 from the previous row. Turn. Rows 7-98 (or desired length): Repeat rows 3, 4, 5, & 6 in order.